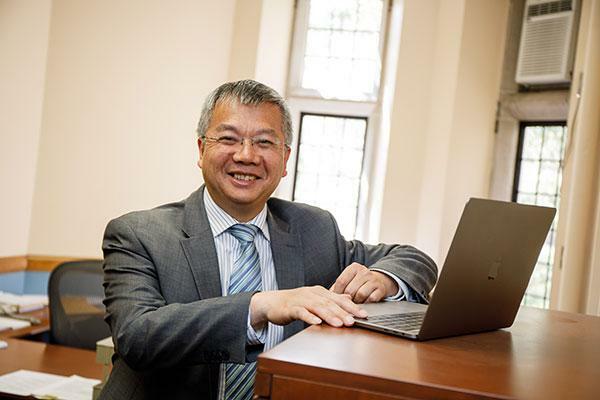 Truly connected communities, says Lehigh University’s Chengshan Xiao, require new thinking in connectivity. The mention of smart cities may bring to mind visions of a sparkling future metropolis, churning smoothly and silently: gleaming monorails gliding by with nary a whisper, walkways whisking pedestrians to their destinations, wireless and instant access to information on demand, and lights brightening and dimming on cue as you enter or leave a room. The convergence of cyber and physical infrastructure, where electronic data is collected by sensors and transmitted securely to urban planners and citizens alike, will allow for better decision-making and efficient use of resources at every level. But, how do we get there from here? One key ingredient, says Chengshan Xiao, Professor and Chandler Weaver Chair of the Department of Electrical and Computer Engineering at Lehigh University, is a new approach to supporting the gargantuan wireless communications requirements of such a sprawling urban enterprise. According to Xiao, multiple input multiple output (MIMO) technology, in combination with millimeter wave (mmWave) spectrum utilization, are crucial in enabling an enormous data-rate increase for next generation wireless networks. And he has attracted $200,000 in support from the National Science Foundation to explore the concept further. In massive MIMO systems, a very large number of antennas are employed at the base station to communicate with many remote stations, or mobile users, simultaneously. Xiao says that this large number of antennas can lead to prohibitive cost and power consumption if the conventional approach–one radio frequency (RF) chain per antenna–is adopted. In the current project, which formally kicked off on September 15, 2018, Xiao’s team is focusing on developing what they call “novel hybrid precoding designs” in order to reduce the number of RF chains and maximize the system’s data rate. The hybrid precoding consists of analog and digital precoders, where the digital precoder is realized by a small amount of RF chains, and the analog precoder is realized by phase shifters. In this way, he says, the cost, complexity and power consumption of massive MIMO systems can be reduced dramatically. This project aims to investigate hybrid precoding design methods that can drastically reduce the cost, complexity, and power consumption while approaching the optimal performance of fully-connected, unconstrained massive MIMO systems. Dr. Chengshan Xiao serves as Professor and Chandler Weaver Chair of the Department of Electrical and Computer Engineering at Lehigh University. Xiao, a Fellow of the Institute of Electrical and Electronics Engineers (IEEE) and a Fellow of the Canadian Academy of Engineering, previously served as a Professor at Missouri University of Science & Technology, and as a Program Director with the National Science Foundation’s Division of Electrical, Communications and Cyber Systems. An internationally recognized researcher and educator in communications, high-frequency technologies and theoretical electrical engineering, Dr. Xiao explores topics such as wireless communications, signal processing, and underwater acoustic communications. In previous academic appointments, Xiao has served on the faculty of Tsinghua University, the University of Alberta, and University of Missouri-Columbia, and has held visiting professor positions in Germany and Hong Kong. He has also served as a senior member of the scientific staff with Nortel Networks. He is recipient of several distinguished research awards, including the prestigious Humboldt Research Award. He holds three U.S. patents, and algorithms he developed have been implemented in Nortel’s base station radios. Xiao continues to play an active role within IEEE, the world’s largest technical professional society, as well. He has served as the Editor-in-Chief of IEEE Transactions on Wireless Communications, and as Associate Editor of IEEE Transactions on Vehicular Technology, of IEEE Transactions on Circuits and Systems-I, and of the international journal Multidimensional Systems and Signal Processing. For the IEEE’s Communications Society, he has served as an elected member of its Board of Governors, a member of its Fellow Evaluation Committee, Director of its Conference Publications, and as a Distinguished Lecturer. He is Founding Chair of the Technical Committee on Wireless Communications, and in 2010 served as Technical Program Chair for the International Conference on Communications. He is recipient of several IEEE awards, including the IEEE Communications Society Joseph LoCicero Award (2014), the IEEE Wireless Communications Technical Committee Recognition Award (2015), and the IEEE Communications Society Harold Sobol Award (2017).